Ladies, are you frustrated with your current exercise program? Well, it's time to try weight loss through strength training. Popular workouts like spin classes and aerobics are good for your body. But you can also lose weight with strength training. And for many dieters, it works better than any weight loss workout program they've tried before. Strength training provides many benefits. Lifting weights helps you tone your muscles up and decreases your risk of injury. It can help you look leaner and it's a great way to firm up trouble spots like "bat wings" on your arms. And doing some exercises to improve strength can also help you slim down. Surprised? There is a myth that using weights can cause women to bulk up. But using light or medium weights will not have this effect. So, if visions of a burly bodybuilder pop into your head when you think of strength training, it's time to change your mind, because getting stronger will help you get slim quicker than aerobic exercise alone. 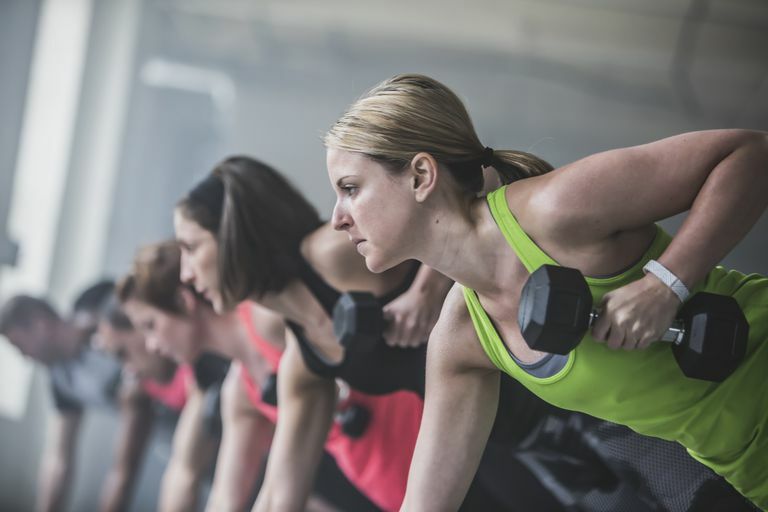 Research has shown that those who follow a strength training program for two months burned an average of 200 calories more per workout than those whose exercise regimen did not include strength training. The benefits of strength training even continue when you're at rest. Your metabolism stays raised for some time after your workout, even if you are inactive. While some questionable diet supplements may promise to help you lose weight while you sleep, exercise keeps that promise. You can do a simple strength training program at home with basic exercises that require little to no equipment. You can also do your own modified version of weightlifting with household items if you can't afford a set of dumbbells right now. So how do you start? Simply, hold a can of soup in each hand and do some chest exercises to tighten the upper body. Then add a few exercises to tone up your arms. You can make up your own program or follow a step-by-step workout developed by a trainer. As your fitness level increases, move up to heavier items a little bit at a time at a time. Try filling up a small milk or water bottle with some sand or kitty litter and then increase the amount to make the weights heavier. When you feel it's time to kick it up a notch, Consider purchasing resistance bands or light-weight dumbbells. These strength training accessories are generally inexpensive and take up little space in your home. Some resistance band sets even come with videos that provide step-by-step instructions to help you learn how to use them. Once you have your equipment, it's time to ramp up your workout program. Check out cheap or free online workout videos to follow in the privacy of your own home. Or rent an exercise DVD from the library. Ready to go big time? Make an appointment at the gym or your local community center for a tour and strength training consultation with a personal trainer. Be sure a trainer takes the time to show you how to use each weight lifting machine. Take the opportunity to ask any questions you may have. You also need to know what weight level to start out at. You don't want to ruin any progress you've made by lifting too much, too soon, or by using the machine incorrectly or unsafely, which can lead to an injury. How Much Strength Training Is Needed for Weight Loss? To lose weight, just 2-3 days per week of weight lifting will do the trick. A study conducted at the University of Arkansas showed that subjects who strength trained two days per week gained the same benefits as those who pumped iron three days a week. So which days are best for weight lifting? You can choose any days that you wish. But experts recommend that you skip a day between strength training sessions to give your muscles a rest. For example, you could do strength training only on Monday and Wednesday or just Tuesday and Thursday and be getting enough workouts to see results. To make the most of your program, don't forget about your aerobic or cardio workouts. You can follow your cardio workout with some strength training every other day and you should see visible results in a matter of weeks. Don't panic if the scale shows a little bit of weight gain. Muscle weighs more than fat, the number may go up, but you'll get proof that your strength training program is working. Your clothes will fit more loosely because of the overall toning strength training provides.